Light, Fluffy and not too sweet. A crowd pleas-er every time. In a large bowl, mix together cream cheese and powdered sugar. Add Peanut Butter and Milk. Fold in Whipped Topping until thoroughly combined. Pour into pie shell and chill. Plus 75 othersFrom around the world! 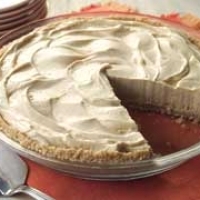 OMFG!As I was looking at your recipe on this peanut butter pie.Yours is the same as my friend Wilber's (Wilbers Peanut Butter Pie).The ingredients that is.The amount is alost the same. I haven't been able to find this in such a long time! Thank you! We used to drizzle chocolate syrup over the top and had a splash of lemon juice. Thanks again! Made two of these for Thanksgiving dinner (tomorrow) I tasted the spoon.. lol Delicious!! I haven't made this since 8th grade home ec. class, (1993) but it's just as good as I remembered. Thanks for the recipe! 5 forks for you! I made this and it was awsome! So easy and fast to make. Thanks!! We used to buy this at the Big Stop in Salisbury, New Brunswick quite regularly, but we moved. Now I can make it myself. This was really good. I made it with 1/4 cup more peanut butter and with an Oreo pie shell instead of graham cracker. Awesome! Thanks for the recipe! I think a friend made this recipe before. I rememeber really liking it because the cream cheese "tones down" the peanut butter taste a little. Sounds great I'll put it to the test on my peanut butter loving youth pastor. Sounds really good...looking forward to making one. This sounds really good. I am sure my grandson would love this! OMG! Sounds like something I could eat whole! Oh goodness yes! I have been looking for a peanut butter pie recipe. I've had it only once in my life, and it was unforgettable. THANKS choco!